It seems like there are very few good commenting systems on the Internet. Based on my experience, the free or low-cost services can be very barebones, sluggish or just a pain to use (I guess you get what you pay for). After being saddled with Facebook Comments for several years, I was happy when my previous employer switched to Disqus. It’s not perfect, but it was the service I was most familiar with and it offered a fairly robust series of moderation tools that I _definitely_ put to use. 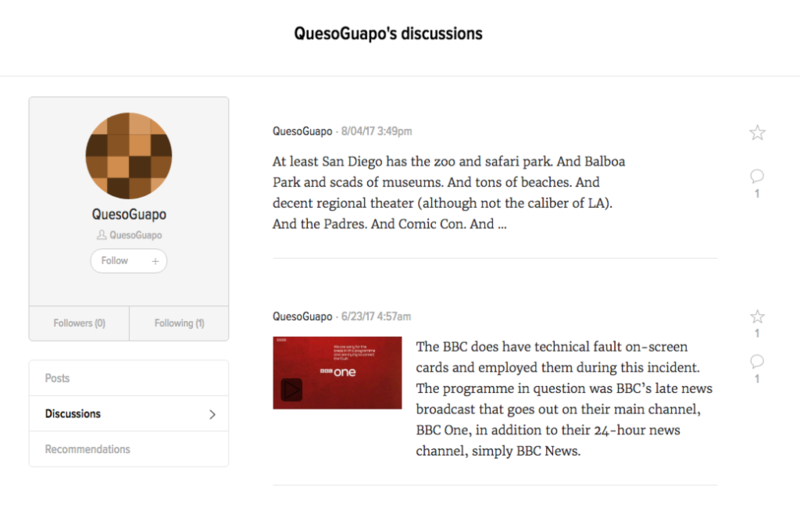 I no longer have to moderate comments on a regular basis but I’m still partial to Disqus, especially because it’s the system used on one of my favorite websites — The A.V. Club. Commenters there have a love-mostly hate relationship with Disqus, particularly during the service’s hiccups. At the same time, A.V. Club stories garner dozens and hundreds of comments and Disqus (mostly) handles the workload. Unfortunately, that’s apparently about to change in the next few months. In the past few years, The A.V. Club and its sister publication, The Onion, were purchased by Univision. The Spanish-language broadcaster has been expanding into different sites and also added the Gizmodo network (formerly Gawker). One of Gizmodo’s assets is a content management system called Kinja. I’m not sure about _all_ the objections about Kinja, but the biggest annoyance for me is that posters and their initial posts start off in a “pending” status. When you’re in pending status, your comment is out of view unless the reader clicks on “View Pending.” Even then, the pending comment is displayed in gray and tagged “PENDING APPROVAL” to reinforce how “pending” it is. Posts can be moved out of pending if they get enough likes/stars. I also believe that the posters can earn a trusted-sort of status but the process of how this is done isn’t well explained. I must admit I haven’t seen _too_ much spam on Kinja sites lately, but trolls still abound. Generally, the system puts up unnecessary hurdles to interaction. All in all, it’s a clunky system. Also, as I understand it, It’s the underlying content management system for the blogs that use it (like Deadspin). It makes it easier to swap content between sites, but they all look bland and cookie-cutter. For as much as people gripe about Disqus on A.V. Club, the users there have built a vibrant community centered around a common love of pop culture. It’s gotten a bit more combative as the site has published more politically focused articles (which seems somewhat understandable, given the current president’s symbiotic, yet toxic relationship with the media). The comment area has also remained a reliable fixture of the site, even as it undergoes changes (with some longtime features being cut and some dubious elements added — including some sponsored content that the commentariat lustily mocked). Despite the increasing politicization, The A.V. Club comment area remains a mostly positive forum full of inside jokes, truly awful puns and considerable passion. I sincerely hope that the switch to Kinja doesn’t negatively affect this oasis. This entry was posted in Gadgets and technology, TV, Film and Radio, World at large and tagged commenting, comments, discussions, online community, online culture. Bookmark the permalink.